← [Anime Music Spotlight]: Love Live! (μ’s) – Snow Halation, and Merry Christmas! Christmas seems to be the season of visual novel releases this year with a number of recent completed translations. 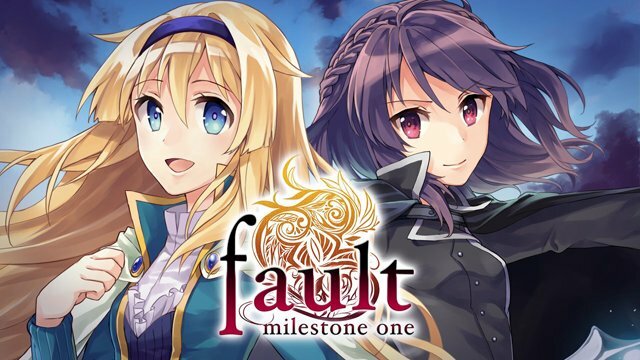 fault –milestone one- is the first project worked on by ALICE IN DISSONANCE, a group with the goal of combining western storytelling with eastern art. While I think the success of that particular goal is debatable, fault is one of the better short visual novels I’ve read in recent memory and certainly isn’t a bad addition to the current line-up of VNs available on Steam. 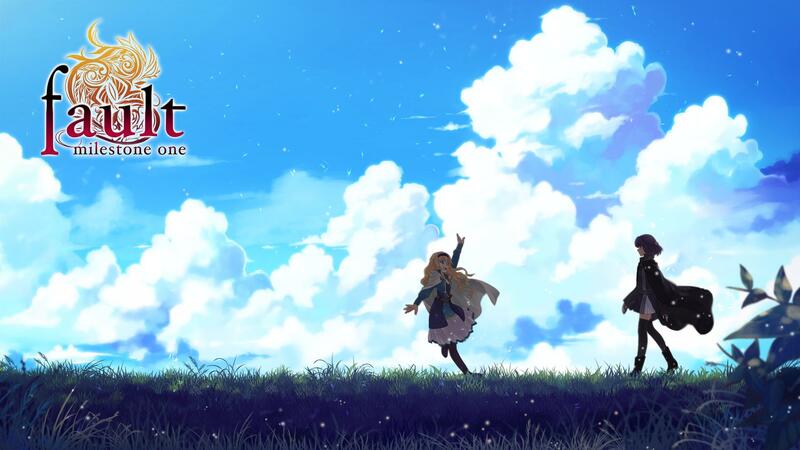 Despite some issues with pacing, grammatical mistakes and inconsistent visuals, fault’s interesting concepts and endearing characters make it worth your time and earn it a tentative recommendation from The Geek Clinic. Manakravte, the use of purified energy found coursing through the veins of the world and all living things, has characterized life in the Inner Pole for as long as anyone can remember. It has enriched every aspect of life, from creation to communication, and when the capital of Rughzenhaide, one of the region’s kingdoms, falls under attack, it allows the princess Selphine and her protector Ritona to escape with their lives intact. They are whisked away by Manastreams flowing underneath the soil and emerge in the last place they would have thought possible. The Outer Pole, the Godforsaken Continent, is a place where Mana has never been plentiful and people have had to struggle to merely survive. Using the mysterious discipline known as ‘science’ to harness what little Mana they can get their hands on, those of the Outer Pole have developed massive corporations and technology that the royal pair have never seen in their homeland. On the journey to return home, they meet a happy, bubbly girl by the name of Rune who agrees to show them around. The locals don’t trust Manakravters, however, and any caught in the Outer Pole risk suffering Manashock Syndrome. I immediately found fault -milestone one- interesting because it takes the time to establish the importance of Mana and Manakravting before whisking its readers away to a setting where those ideas simply don’t apply. Rather than feeling like I had missed out, however, the contrast between the areas described earlier in the tale and the reality the characters faced kept me that much more intrigued by what was going on. What starts off with a grand premise and a great deal at stake becomes something smaller without losing its importance, which I thought was quite well done; there’s an emotional component to the lesser scale that allows you to connect with the characters that probably wouldn’t have worked its way into the production otherwise. My problem with the story itself is that, after having built up the problem to be faced and prepared the heroines to face it…it kind of just goes away by itself, and suddenly at that. The ending and epilogue are a tad too rushed for my liking. Additionally, the short length of the story itself means that it lacks the impact of a longer title, so while the experience itself is satisfying it fails to leave a lasting impression. 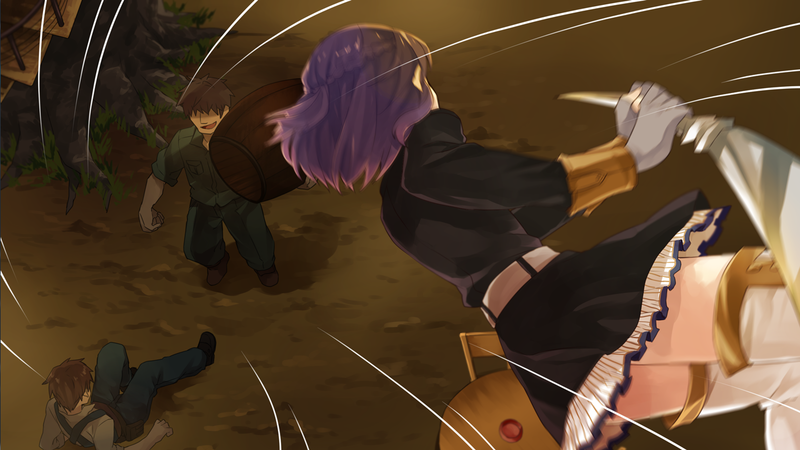 While it’s difficult to evaluate the quality of characterization in a visual novel of fault’s length, I can say that there was enough room left for future releases to develop the main characters and allow readers more of a chance to connect to them, which is something that didn’t happen for me in this first instalment. This is one of those times where character development has been set aside to focus on a story that will grip readers, which is only okay because there are sequels planned. Strangely enough, it was the side characters that were given the most time in the spotlight (no, that doesn’t make them main characters) this time around, and their personalities and motivations had been well developed by the end of the story, even if they felt a little contrived (only a little, mind). In any case, I felt that any of fault’s deficits in character development were made up for by the events surrounding those characters and keeping them on their toes, so there aren’t any major issues in this area. Is anyone going to tell her that you should never, ever hold a weapon like that? fault’s technical aspects present us with a mixed bag. On one hand, the package itself is very well presented, with the UI, visuals and feel of the OST fitting together very well. On the other, character sprite and CG quality are a little variable and it’s very apparent which components have had more time put into them than others. Some characters have fantastic clothing designs and natural poses/expressions, while others come across as a little lacking in both departments. Either way, the art isn’t top-notch, high definition stuff like you may have seen in longer releases but it is easy on the eyes in its own stylized way. Having played the full release and not a beta version, I have to mention that a number of grammatical errors and typos were present. While there weren’t enough to ruin the experience, I noticed them in more scenes than not which isn’t really acceptable for a commercial product. Hopefully these issues will be fixed up in future patches, however, so I haven’t allowed them to affect my final score. The background music, while not something I would seek outside of the visual novel, fits each scene it is used in well and is pleasant to listen to, adding positively to the experience overall. It’s worth quickly noting that there is no voice acting, which is something of a shame, as it would have added another dimension to the characters that the story failed to develop. Summary – All in all, fault –milestone one- makes for a satisfying and interesting experience but has little lasting impact. The story is intriguing and somewhat unique, if not to the same degree as other, bigger titles. While I may not be crying my praise from the rooftops I enjoyed reading it and am looking forward to the planned prequel and sequel visual novels. This is a story and setting that could do very well in episodic instalments that lead up to a massive finale, so I sincerely hope that we will see it develop over time. 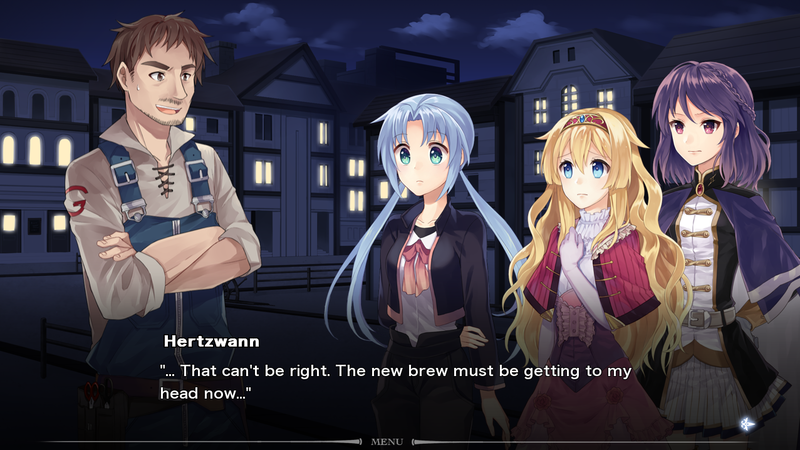 This entry was posted in Reviews, Visual Novel Reviews and tagged alice in dissonance, fault, fault -milestone one-, milestone one, Review, sekai project, Visual Novel, VN. Bookmark the permalink. I see you’re watching Seitokai no Ichizon. I find this really funny because after that you would have watched almost all of the anime which the Haruhi craze spawned after 2006 (Lucky Star (2007) Seitokai (2009) K-on (2009) Angel Beats (2010) Kokoro Connect, Chuunibiyo & Hyoka(all-2012)) before watching actually Haruhi itself. It’s going interesting the amount, “Oh! So that’s where that scene comes from,’ moments when you do get around to that series. It’ll just be like me and almost all of the film references from the Simpsons after watching my Alfred Hitchcock marathon. I was shocked by the amount of scenes they used that came from that director’s films. On the other side of things, Haruhi was partially supposed to be a deconstruction of anime like Azumanga Daioh, which ironically was a deconstruction of the high school anime that came before it. I shiver at the what mangakas must think of what came after, looking at Lucky Star and going “Oh god, what have I done to anime?” And yes this commend went on longer than intended. Oh and I finished Nagi no Asukara last night, and I mean the whole thing in one night. This doesn’t mean i liked it though, however, for how much I hated the love pentagonal, it was very pretty. I condensed your comments into one for easy replying. I should probably say that i’m going to watch it, since I won’t actually start till the 13th of January XD But Haruhi’s almost here too! I’ll be sure to keep an eye out for those sequences, but is Haruhi really the first show that explored that much territory? If so, I hadn’t realized at all. Haven’t seen Azumanga Daioh, would you recommend it? As for Lucky Star…I think we watched half of an episode and moved on. Tell me what you thought of it overall in your next email. I found the love pentagon to be frustrating at times but didn’t mind it too much, and really enjoyed the other aspects of the show. I can agree with your points, but still rather see the relevance in it all. Even though there will be many installments, judging by the length and scripting, I’m concerned with it dragging on and really don’t care for a narrative spanning more than 5+ volumes without it warrant or in this case, making lax progress. It’s a bit too early, so hoping the 2nd volume is more pertinent, even if it does take another detour. As far as characterization goes, that too is premature to call, but looking at how the side characters (if you want call them that) have some much more ethos poured into their personalities than Ritona and Selphine, it is somewhat disappointing. Again, maybe the sequel and prequel might make more of a definitive case, yet still have reservations on thinking otherwise. Either way, I still mildly enjoyed it – just needs a lot of work on whatever follows it next. I can definitely see why you’re apprehensive about the future installments in the series and agree that it really could go either way. The reason I think multiple episodes are required is because, after the pace of the first “milestone”, a rapid ramp-up in action followed by a conclusion to the entire series would be incredibly rushed and unsatisfying. I think a series of individual (and interesting!) stories with a loose overarching plot tying them together would allow the characters to build up and gradually grow on the audience, and develop themselves into something more than they were are the start of the series, would make for a good formula. Once that had been accomplished, a full, longer-length, plot-heavy finale using developed characters that the audience is fully invested in (like Muv Luv Alternative, for example) could be used to round things off beautifully. Of course, that expects a lot from the writers and given what we have so far i’m thinking it’s unlikely we’ll get all that…but I can hope! Yeah, I guess a little baseless optimism isn’t bad since I will admit I am being too skeptical. Although, just hope that the “milestones” actually amount to something other than 6 volumes or so that move at a snails pace and 4-6 hours apiece. Again, too cynical, but hoping it gets better much like how Dysfunctional System started off. I have no problem with multiple episodes, just how well they fit together and not for showing off what it can do with the narrative. Shortest way I can put it without going into 3 page analysis of the story, lol. Speaking of episodes, I haven’t played Muv Luv yet, but plan to get to it…just confused on what is the intend order to play them in. I know you, Kai, and Lazarinth did a couple of post on them, yet tried to avoid them until I played them for myself. Don’t have the time now, so maybe sometime in the Fall I can get started. I get what you mean. If it’s done well, it could really kick off and be awesome. If it’s done poorly…well, let’s not think about it. As for Muv Luv, Extra and Unlimited come first (they’re on the same disc) followed by Alternative. Extra is a slice of life comedy that lets you get to know the characters while Unlimited and Alternative are the real meat of the series. 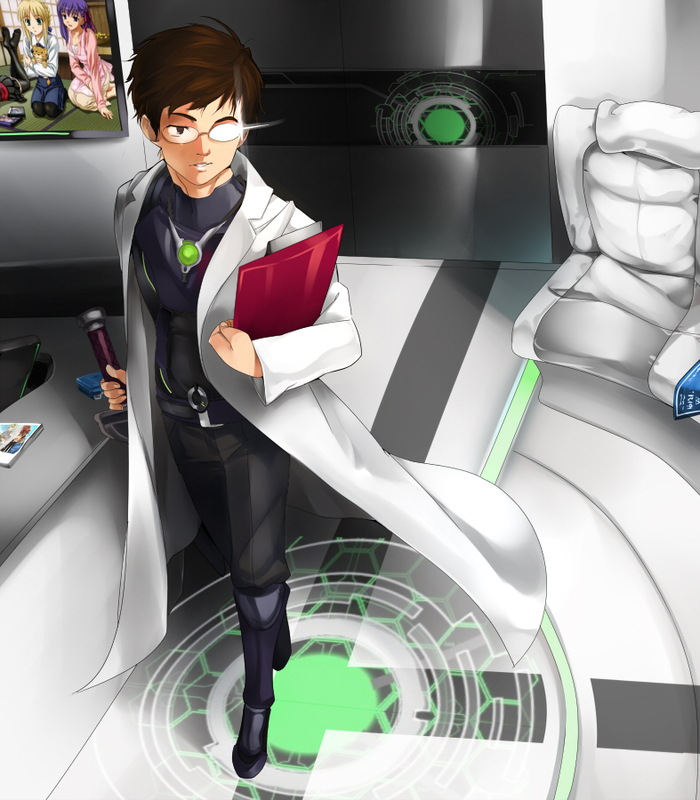 Alternative is easily my favorite visual novel of all time. A fair number of people really aren’t keen on Extra, and I agree that it’s not as good as its sequels, but I also say that it’s well worth playing through because you won’t understand some important events otherwise. You only have to complete two of the five routes, anyway. I hope you enjoy the series, i’ll be looking forward to hearing what you think of it!